White Owl Blue Vanilla 2 for 99¢ Cigarillos are perfect for those who love smoking cigars but don’t want to spend a fortune. These premium cigars are sure to delight your senses! The cigarillos are composed of natural wrappers and binders with fillers that contain a blend of tobaccos from five different regions. From the very first drag, you will be able to tell how exquisite these machine-made cigarillos taste. The beautiful sweet aroma and the nice slow burn makes these cigars a favorite for both newbies and veterans! 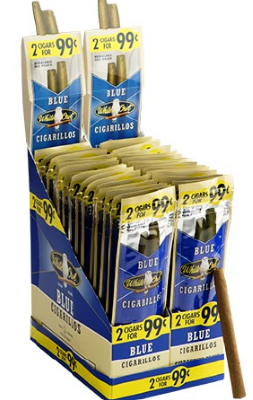 These incredibly smooth White Owl Blue Vanilla 2 for 99¢ Cigarillos little sticks come packaged in 30 packs of 2, in foil fresh pouches for guaranteed freshness.